Over 4,500 houses located in different parts of the Ethiopian capital, Addis Ababa have been earmarked to be demolished this year [2010-2011 fiscal year] under a development plan. The plan will not only affect illegally built houses. For the time being, the city is struggling with compensation payments to owners of legally built structures which will be affected by the plan. Most of the houses set to be dismantled are in shanty areas built on plots which are to undergo re-development. Most are scattered on lands meant for the city’s main roads, according to the administration charged with the development plan. The plan which includes the construction of high rise buildings will see 471 kebele and private houses in the Wolo Sefer area, an area adjacent to the World Bank representative office located on the Bole road, demolished. Kirkos district, an area adjoining Economic Commission of Africa (ECA), will also be affected. A total of 280 private and kebele houses and micro businesses are to be brought down under the exercise. The development plan will also be extended to the entrance way to Meskel Square where another group of 232 structures occupied by kebeles, private individuals and Government Housing Agency will be dismantled. Basha Wolde Chelote in the Arada district of the city alone should have a total of 1,271 houses demolished in the city’s re-development plan. The administration has also indicated that the expansion of the Sheraton Addis Hotel will affect 2,275 kebele and private houses surrounding the hotel. In the meantime, the city requires a significant amount of money in compensation for affected houses occupied by private individuals and Government Housing Agency. Lacking adequate financial support, the city’s administration tenant relocation program, which consists of resettling tenants before demolishing the existing ones, is expected to be the toughest task. And a 115 million birr compensation payment from Sheraton Addis, according to the Addis Ababa municipal administration, is not enough to cover the compensation claims. The city will repossess 27,827 square meters of land this year, if the exercise goes as planned. The demolishing exercise has already started in different parts of the city. 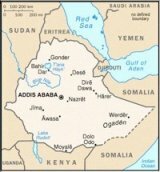 • Ethiopia to overthrow Eritrean government?